There is so much that I’ve learned from organising and participating in LX2017. Here are three things that really struck me. 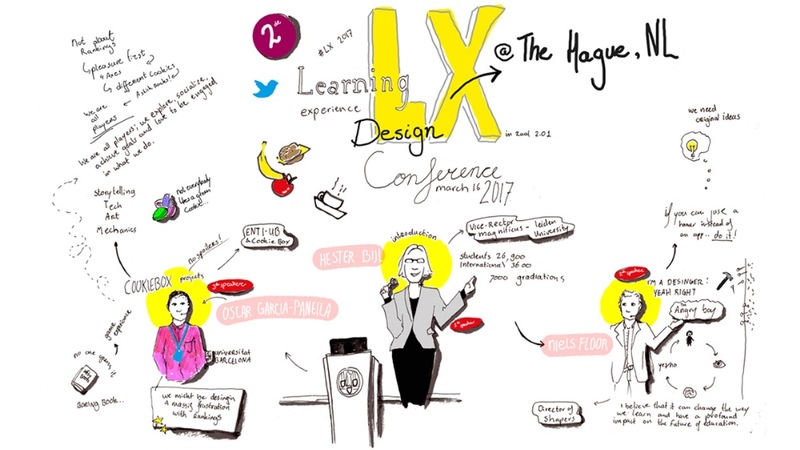 At LX2017 we welcomed an international group of experts and participants. Normally at a conference, the participants come to learn from the experts. This felt more like a festival of learning where both the experts and the participants were learning from and with each other. In the end we were all students and teachers which feels great as everybody got to share their expertise. Here’s something really important that people finally are catching on to: learning experience design is more than just adding user experience design, games or new technologies to education. As keynote speaker professor David Dye of Imperial College stated, it’s a new field of expertise that requires a different way of thinking and working. The basic of the concepts of LX design, like a human centered approach, are quite simple. However, the application of these concepts can become rather complex and challenging and have far reaching consequences that need to be taken into account. During the wrap up of the day I mentioned how in the past year more has happened in the field of LX Design than the ten years before that. At this time LX design is still quite new to most people. Meeting like minded individuals with a shared passion for learning and design is liberating and powerful. These are the pioneers who are looking for better ways to learn. When I see the talent, the potential and the excitement within the LX design community, I know change is coming. If you’re interested in attending the next conference please visit www.lxdcon.com for info and tickets!